You are here : Home > Campaign > Campaigning works! Campaigning is powerful because it addresses poverty and injustice head-on. It tackles the root causes of poverty, not just the symptoms. Thanks to tens of thousands of you who’ve taken part in our campaigns over the years, we’ve witnessed some historic breakthroughs. CAFOD ambassadors join the Power to be campaign. It’s a scandal that one in six people worldwide still live without electricity, when local, renewable energy can help lift communities out of poverty. In 2017, over 30,000 of you spoke up loud and clear to the World Bank and to the UK government – and they are starting to respond. In replies to questions from MPs, former Secretary of State Priti Patel stressed the strong influence the UK government has as a major shareholder at the World Bank. She also emphasised the importance of speaking up for energy spending that benefits the world’s poorest people. In December 2017 the World Bank took a big step to protect the planet and the poorest people by stating it will stop support for oil and gas after 2019. Your voice has been heard! For months, almost a thousand people in the Mauá community in São Paulo – including older people, pregnant women, and children – have lived in fear of being thrown onto the streets. Over 4,000 of you signed petitions, sent emails, and shared #FicaMaua photos on social media – all calling for a halt to the eviction. Your actions boosted a successful international campaign. Hundreds of families now have a roof over their heads for good. In 2015, we responded to Pope Francis' call to care for our common home by campaigning for an ambitious global climate change deal which put the poorest people at its heart. Nearly half of all MPs in the UK were lobbied on climate change when 9,000 passionate people turned up at Parliament to make a stand. 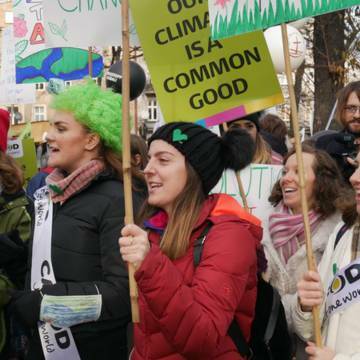 CAFOD supporters from all over the country were there in force to speak up about the impact climate change is having on people living in poverty. Later in the year, over 40,000 people in the UK added their names to a global Catholic petition calling for action at the Paris climate change talks. Public pressure like ours contributed to the agreement of a strong climate deal in Paris, which put the world on the path to a low-carbon future, stated that temperature increases must stay well below 2°C, and ideally be kept to 1.5°C, and reaffirmed the commitment of developed countries to support poorer countries financially to cope with the impacts of climate change. In 2013-14, 60,000 of you joined us in asking the Prime Minister to take action to help alleviate the suffering of the 870 million people who don't have enough to eat. During the campaign, you encouraged rich country leaders to pledge £2.7 billion to tackle child malnutrition between now and 2020; you helped secure a commitment from the UK government to spend 0.7 per cent of national income on international development aid (see below); and thanks to pressure placed by you, a hard-won reform of EU law was agreed, requiring large, publicly-listed companies in all EU countries to be more transparent. This will include some global food companies, bringing us one step closer to a fairer food system. CAFOD campaigners supporting aid and development. On 20 March 2013, the UK became the first G8 nation to commit to spending 0.7 per cent of national income on international development aid. This announcement has been 43 years in the making and Archbishop Desmond Tutu paid tribute to CAFOD campaigners for their “tireless work” and “steadfast refusal to accept the status quo”. You have helped change political thinking on aid. Despite tough economic times, you persuaded all three main political parties to back the 0.7 per cent target. In May 2015, MPs from all parties voted in favour of making this commitment legally binding. In 2013, we welcomed new EU transparency legislation. Finally it will be possible to find out about who benefits from the activities of multinational oil, gas and mining companies and if local communities are getting a fair deal for their natural resources. In 2008, the UK became the first country in the world to make carbon emission cuts a legal requirement. As part of our Climate Justice campaign, you lobbied MPs for three key changes – annual checkpoints, more ambitious emission cuts and the inclusion of emissions from shipping and aviation. And we got them all! Between 2006 and 2007, 50,000 CAFOD campaigners used consumer pressure on major UK jewellery retailers, asking them to sign up to a set of golden rules to end the sale of dirty gold. Parishioners in England and Wales created gold petition chains, which were handed into local stores of Argos and Ernest Jones, championing the rights of those affected by mining. As a result, seven major UK jewellery retailers signed up to the rules, along with 69 more internationally, thanks to the No Dirty Gold campaign in the USA. In 2005 over 700 Catholic parishes were represented in Edinburgh, as over 250,000 people rallied to make poverty history. Globally 31 million people united in this global call to action against poverty. As a result, world leaders pledged to increase aid spending by up to $50 billion and the G8 agreed to cancel some of the remaining debt owed by some of the poorest countries to international institutions like the World Bank. 420,000 CAFOD supporters added their names to the Jubilee 2000 petition, calling for the debt owed by poor countries to be cancelled. This petition was a record-breaker – 24 million people around the world signed it. $110 billion dollars of debt was cancelled, freeing up money for hospitals and schools. A great return for just signing your name!